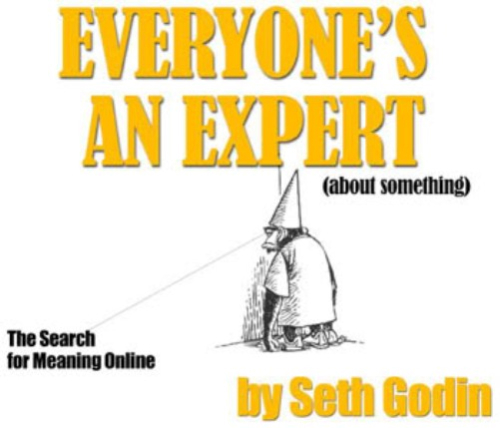 Yes, everyone is an expert in something but they aren’t an expert in everything. It is how we make decisions about what other experts to believe that will have a huge impact on our beliefs. Everyone is an expert in something but they can’t be an expert in everything. At some point we all have to rely on the expertise of others to guide us through our lives. I am a biologist, however, the vastness of the field of biology leaves me in the position of deferring to the knowledge of my colleagues on many topics because I don’t have time to do the research I need to do to answer all of my questions. How much more must I rely on experts in fields outside of biology? Who we choose as experts and thus adopt – put our faith in – their positions will make a huge difference in our lives. The reality is that all of us at some point will trust a source of information that is not reliable. The real challenge in our lives comes when we are confronted with information that challenges what we thought we knew. How do we respond? Do we allow ourselves to examine the new evidence or do we find ways to ignore that evidence and continue in our same beliefs? Usually new data only challenge superficial beliefs but sometimes our deep-set convictions can be challenged. The former beliefs are easily discarded and replaced with the new knowledge while the latter are often so important to our identity that it can be difficult to consider that we may be in error. As a result we may hold on to our beliefs even in the face of overwhelming data against our position. For many Christians the origins of the Earth is one question for which they must rely on other experts to answer because so few are familiar with the evidence. As a result, the trustworthiness of the source is of utmost importance if one is not going to invest time in researching the topic personally. With so much importance placed on our choice of experts it seems to me that we need to choose who we place our faith in very carefully. It could be we should be spending as much time investigating the source of expert advice as we would have spent considering the topic itself. When we are convinced a priori of the truth of something even before we have studied the topic we are prone to place our faith in experts who confirm our beliefs. This is referred to as confirmation bias (See: The Salty Sea and the Age of the Earth: Confirmation Bias?). Recently I was directed to an example of one such person placing great faith in a particular expert. I believe this illustrates how many people, convinced the Earth is young, are placing their trust not where they think they are – i.e. The Bible – but rather in science. This example comes from the comment stream on a post by Gary DeMaar on his site americanvision.org where I came across a comment by Michael Riemer, author of “It Was At Hand: A Biblical Response to Dispensationalist” (2002 Xulon press). Michael’s comment struck me as representative of the most ardent supports of young earth creationism. His views are not representative of the average creationists but they do represent the vocal minority of creationists that inhabit the internet and his logic is characteristic of leading advocates of young earth creationists. Henry M. Morris wrote a hydraulics text book used in “secular” collages. He knew, very well, all about sedimentation and flood geology. One real expert, is worth a thousand modern so-called experts in geology. Do you know that studies in sedimentation have shown that many times the things we think were laid down first, the rocks at the bottom, were not, but were laid down at the same time as those on top. And as Morris and other experts believe, and have shown, the whole geologic column was laid down at one time, during a one time event, the flood in the days of Noah, about 4,500 years ago. The overwhelming evidence for a world-wide flood helped my faith in the Word of God. The so-called science of modern geology can’t hold a candle to the real experts of the rocks. People like Morris. AIG has strengthened the faith of countless thousands. It has opened the eyes of many to the piffle that so many times passes for science. There is a reason why many young people leave the church, and yes, proponents of theistic evolution, of which people like John Walton may have something to do with it. What Michael has written captures the essence of where I think many Christians who have been told the Bible teaches the Earth must be young are putting their confidence: in the hands of what they think are expert scientists! And without even knowing it they may be putting their faith in science instead of the Bible. Their confidence is placed in the belief that experts in scientific fields have provided them with not only enough evidence but overwhelming evidence that earth is young. Michael is putting his faith in experts which, he admits, have bolstered his faith in the Word of God. Having no desire to study the evidence himself he has relied upon what he believes are experts that are “worth a thousand modern so-called experts” to give him the confidence to ridicule (not in the quote above but in many other places) other Christians for even entertaining the thought that they Earth could be very old. I have no doubt that Michael is convinced of a young earth and that he would claim that his confidence comes not from science but is derived from Scripture. However, he clearly feels that scientific evidence has rescued his faith. He is so reliant on the confidence he derives from the “scientific experts” such as Morris that one has to think that were he to come to realize that Morris was not the expert he believes him to be his faith would be severely jeopardized. But he has placed Morris on a pedestal recognizing him as an expert among experts in his eyes. As a result and he isn’t likely even consider the words of other so-called experts thus insulating him from self-examination which could challenge his core beliefs. While Michael will not likely ever experience any doubts about his own blind faith in Morris, many other Christians have found Morris hardly worthy of being called an expert. I am no expert in hydraulics but I don’t have to be to readily identify many misconceptions that Morris and others such as Ham have about science and where they are just outright wrong in their interpretations and reporting of the evidence. Even Morris’s ideas about sedimentation which Michael seems to be impressed with, are but fanciful ramblings and not based on evidence or sound reasoning making his supposed status as an expert highly doubtful. I can readily conclude that Morris, Ham etc… are neither experts in any area of science nor are they even competent handlers of the scriptures because I have quite a bit of training in both areas but many Christians enamored by creation science are not equipped to assess the trustworthiness of Morris and Ham’s claims in the realm of science and may not be able to critique their use of scripture either. Michael wants to believe that YEC provides support for faith and thus say that young people are leaving the faith because they are being weakened by other views. But what happens when young people are led to believe, by people like Michael, that they have strong foundation for their beliefs in the works of people like Ken Ham and Henry Morris and then discover that this foundation is an utter fabrication. “The so-called modern science of geology can’t hold a candle to the real experts of the rocks” – I have to say that this is a ridiculous statement. How can Michael evaluate who an expert on rocks is when he doesn’t know anything about them himself? These types of statements are all too common among supporters of YEC who have very little science background. By their adamant and dogmatic insistence that creation science provides proof of a young earth, zealous advocates, who are themselves frequently not experts in science and thus unable to critically evaluate those that they are following, are demanding Christians believe that the creation science interpretation of the world is the only way to understand general revelation. Ironically, from my perspective, because Michael comes from the reformed Christian tradition he would certainly be ready to test the word of pastors and elders against the Scriptures. A calling card of the reformation is the testing what we hear against the Word of God. To understand the Bible we need to meditate upon it, study it day and night and learn from other Biblical experts. But when it comes to understanding science Michael, like many other Christians, are perfectly willing to fawn over whoever tells them what they want to hear without testing them to see if they know what they are talking about. This post is a re-edited version of a post from 2012. I may not have an advanced degree in geology but I have been around geology and geologists my whole life. My many observations of hundreds of geological formations provide me an opportunity to directly evaluate the claims of Morris and others that formations such as those behind me here were formed over a short period of time not long ago. I am a professional forester and a Christian who was brought up to believe the young universe model. Over the years, I have struggled with the concept of evolution and old universe concepts, and I have come to my own personal conclusion that both are right and both are wrong. I do think that there was a literal 6 day creation, but I also believe that God created time in that week as well. When I say he created time, I am saying that He not only created the present, He created the past. It is a real past. Otherwise, how could ecosystems function without the whole cycle of life being present? On the first day of the second week there were coral reefs, there were dead trees laying in the forest and there were fossils of dinosaurs that really existed in the past that God created. I see no where in scripture where God only created two of each kind. I think he created whole populations of diverse age groups. The chicken and egg question is moot when it’s possible that God created a whole functioning group of chickens with hens that may have been laying on eggs at the instant of creation. I believe old earth geology, but I think it was created in an instant with coal beds and oil pools already in place. I also see no where in scripture where animals did not die before The Fall. Why would Adam and Eve be afraid of death if they didn’t know what death was? Don’t misunderstand me. Adam and Eve were real people, but they were a special creation of God separate from the rest of creation. When I think about things like this, I am reminded of the discussion between God and Job in chapters 38-41. God asked if Job was there when everything was created. He wasn’t, and neither were we. If we truly believe that God is omnipotent, He can do whatever He wants and we are incapable of figuring it out. There’s more, but I have to get back to work. Thanks for your comments Ray. It seems you have worked through this for some time. I have problems with the appearance of age approach but can respect that position because I understand the concerns about where some of the positions of an old earth take people. I don’t see it as an appearance of age. God didn’t create it this way to fool people. He created a universe with whole systems that worked from day one. But in Scripture, sin and death are always tied together from the fall. Romans 8 even expands the view of death by saying that all of creation, not just man, was subjected to death and decay because of sin. If animals died before the fall anyway, would Adam and Eve being covered by their skin be that big a deal? Michael’s logic is, alas, irrefutable, and I have seen it echoed many times in the creationist literature. Given that (a) Genesis 1 is literally true and (b) that correct science tells the truth, the only trustworthy scientist must be one who produces a version of science compatible with the literal truth of Genesis 1. Thus the entire geological establishment, from Bishop Steno to the present day, are promulgating false science, while the only reliable scientists are those like Morris. How does one penetrate this carapace? Yes, there is not much that can be done to reach Michael. He can’t even hear the evidence. The magic elixir of creationism is that it tells its followers that anyone that doesn’t already have the right understanding can’t be trusted to even share the facts with our correctly much less the interpretation of those facts and so there is no reason to even read or listen to their work. 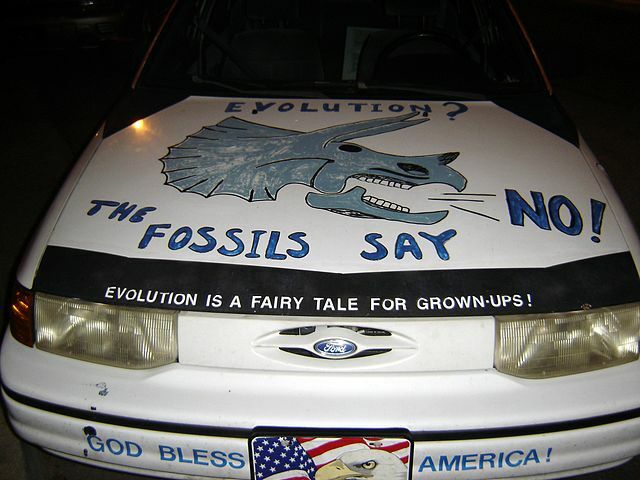 In my experience the staunch creationists is unreachable because the only possible effective approach with then is cut off – a personal relationship based on the common Christian experience. Unfortunately more science education does little though I certainly think it is still valuable and needed because it is the thing that allows a person once, the finally let themselves really look at alternative views understand them. But getting them to look at the alternatives is the challenge and for the post part it takes a personal relationship with a person that is respected to allow the conversations to proceed to a point that they can be productive. This takes time, effort and proceeds very slowly but it is effective in many cases unless they have reached the level of Michael’s delusion. A few factors feed into this. First, the only option offered by YEC apart from a young earth is evolution, and belief in evolution is seen as having been born out of a rejection of the Bible. So it is an unguided process of chance. Second, Genesis is to be read the same way we might read the Dallas Morning News. The “plain meaning of the text” is the correct one. To believe otherwise is to believe that God lied to us. Third, it is obvious that any genuine Christian who rejects the literal, daily-news-type interpretation is a compromiser. So words like “evolution” and “literal” and “compromise” are used liberally to raise the hackles of the faithful and keep them from even listening to other views. And, like the author says, if a person’s Christian credentials are impeccable (i.e., there’s no other evidence that they are flaming liberals or compromisers), then young earth science comes to the rescue with the Bible interpreted so as to support it. But about this article, I’m not a geologist either, but I can readily spot a few issues with what you’ve written. Firstly, Morris and Whitcomb did their work a long time ago, 50 years in fact. Much work has been done since then by ‘YEC’ geologists. For example Tas Walker at Creation Ministries. I thoroughly recommend you do some reading of the excellent work they’re doing at Creation Ministries in the area of Geology. So to attack the thinking that much of the geologic column can be explained by the flood, because it’s based on a 50 year old book, is a straw man argument. Science is an ongoing process, both for uniformitarian geologist and the ‘young earth’ geologist alike. My second issue is that you haven’t actually given any reason why we can’t believe that a global watery disaster shaped much of the landscape we see today. This smacks of elephant hurling. I live in Sydney Australia, and there are geologic features all around me that were formed by a large scale hydraulic event. The Sydney basin, the Blue Mountains etc. Even main stream geology acknowledges this – though they’d never say the ‘F’ word! And similarly in your own country, there are many famous geologic landmarks that can only have been formed by watery processes. Finally you claim that us YEC’s put the cart before the horse ie we think the natural world reflects a young earth and then interpret the bible to suit. You’re sadly mistaken there. It all starts with the authority of God’s word, which then shapes how we see the world around us (everyone has a starting point when evaluating raw data). I am very familiar with Tas Walker and have written about some of his ideas. Having read much if not most of his material I can say with quite a bit of confidence that you have placed your faith in someone who has serious problems with his interpretations of data and you have been presented with a very select picture of the data rather than the whole picture. It is important that you spend as much time reading other interpretation of the data and more importantly, that you expose yourself to the data itself because CMI will only present data that supports what they want you to hear. You must see the data for yourself. If you believe what he has told you about geology then you are putting some faith in him to give you reason to think that your interpretation of scripture is correct. I’m happy to read anything you’ve written that presents the problems you have with how Tas Walker interprets data, if you could insert the links. In regards to exposing myself to the data – I’ve looked with great interest at the massive amounts of sedimentary rock in my area. And also the geological formations such as the Blue Mountains, that show hydraulic erosion on a momentous scale. Just out of Interest, Tas is Australian like myself. Oh dear. Assertions without any published evidence (unless you regard ICR as publication). The references he gives, which I have read, do not support him. Paul, thank you for taking the time to read the articles. Tas Walker gave list of reasons why he did not think that layer represented a long period of time. As a geologist he is qualified to do that. The second author Angus Kennedy,, also a geologist, local to the area, agreed with him. Apart from stating that his references do not agree with him (which is hardly surprising, if they also promote the standard long age view) you don’t give me any reasons why his interpretation of the data is wrong. Also, these articles were published by Creation Ministries, not ICR. Mr Natural Historian, I await the reasons for your confidence that Dr Tas Walker has serious problems with interpreting data.